Take a look back at some of Gladiator’s most historic contests. Among the Shi’ar Imperial Guard, one member stands above the others, both as their leader and as the team powerhouse: Gladiator! Created by Chris Claremont and Dave Cockrum in the late 1970’s, the devoted Strontian has served as a sometimes ally, sometimes foe of the heroes of Earth, in particular the Uncanny X-Men. But with great power comes great opportunity for slugfests. Below, we take a look back at some of Gladiator’s most historic contests. The fists literally started flying as soon as Gladiator and the Imperial Guard hit the comics page. As the X-Men tried to save Shi’ar Empress Lilandra from the power-mad D’Ken, Gladiator and his team tried to stop them. In later issues, when Lilandra regained power, Gladiator would find himself confronting them again—this time as the X-Men battled for the life of Jean Grey! In pursuing a group of Skrulls to Earth, Gladiator mistakenly attacks the Fantastic Four, thinking the shape shifters took the heroes’ forms. The alien easily dispatches the FF, until Mr. Fantastic comes up with a plan. With the aid of Captain America, Reed uses a mento-projector to make Gladiator lose faith in himself, revealing the powerful praetor’s Achilles heel. After using an illusion to make himself look like a reporter—“Cal Kramer”—Gladiator jumps Thor for apparently no reason. Turns out Zarrko the Tomorrow Man sent Gladiator back in time to stop the Thunder God from causing a catastrophe by killing the son of Odin! 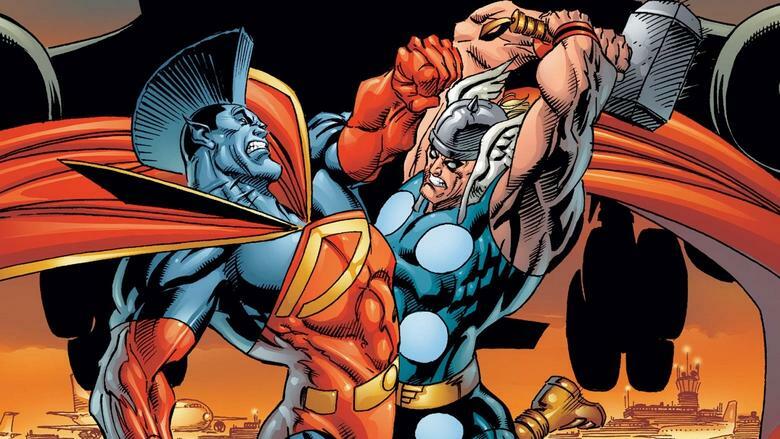 While unsuccessful, it did give him the opportunity to throw down not just with Thor, but also Thor Girl. In another storyline featuring the X-Men entangled in Shi’ar politics, Gambit and Jubilee found themselves trying to save the life of Deathbird, Lilandra’s sinister sister. The mutants manage to hold their own against their foes and Gambit even takes down his more powerful adversary by blasting his “whole deck” of cards against him. Once again, Gladiator comes to Earth to find a shapeshifter who just happens to shift into the form of David Banner, the supposed son of the Hulk! This of course leads to a brawl, with the Shi’ar champion trying to fly the Green Goliath into space and use his eye beams to no avail. When Hulk gives Gladiator a brutal beat down, the kid becomes scared, reminding him of his own childhood fears.